The tiny WPF app (14k) has a textbox allows the input of the C# code, it compiles the code and execute the code after press F5 key. Here is what it looks like. No surprise. 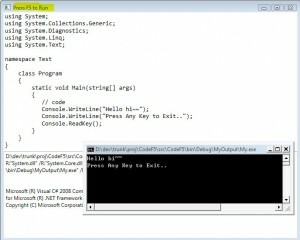 The main part which compiles the code at runtime is using CSharpCodeProvider from Microsoft.CSharp namespace.